Having secured a training contract with a law firm, Alex chose the GDL at City to convert his non-law degree into a law degree. I previously studied a BA Politics and East European Studies, and I wanted to do Law as a career, and the GDL is the course needed to convert my non-Law BA into a Law degree. I had also secured a Training Contract with a law firm, so I needed to convert as soon as possible. City, University of London has a reputation in the field for a demanding GDL which pushed students beyond their competitors. Practitioners I’d talked to had all recommended City as more rigorous and giving a more thorough legal education than other providers, and as I had the choice, I chose The City Law School. I am currently studying the Legal Practice Course (LPC), due to finish in June 2015. I start work at Clyde & Co in August 2015. Do the work as it comes, and make sure you don’t fall behind. Being organised is the key. Don’t panic. It will seem as if you have a lot of reading and work to do, but it will all come together at the end. Keep your head down, do the work week by week, and you’ll be pleasantly surprised when it comes to revision time. 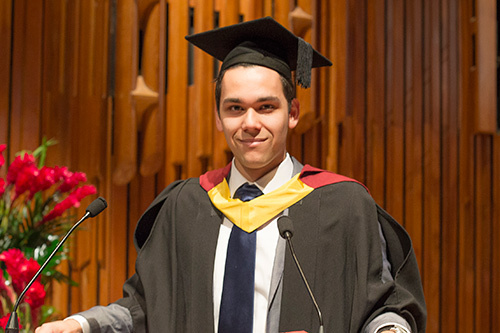 Alex was a GDL student representative during his time at The City Law School and was chosen to be the Student Speaker at the 2015 graduation ceremony for The City Law School.